With this book every foreigner, whether expat or immigrant, can practice questions and answers in Dutch. In this book you will find many questions that you might want to ask in different kinds of settings. You can practice a lot with these exercises. This way the grammar of the question will become automatic for you when you say the question in real life. You can concern yourself with the content of your questions and answers instead of worrying about how to put them. Topics in the book are for instance citizenship and work. Every topic provides a large amount of questions and answers. You will practice the speed of your sentences, you will learn to use the grammar without thinking and you will train your eloquence in a variety of situations. Also for the integration exam. The grammar in the questions and answers gets more complicated towards the end of the book. Working with the included CD-Rom you can vary the tempo of the questions in order to practice quicker answers. The course presented in this book is suitable for students at language proficiency level A1 to A2. It is compatible with all NT2 and civic integration courses and can be used both at home and in a class setting. Taalpingpong will also prove useful for expats at language proficiency level A0. 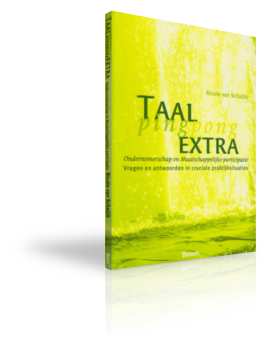 Taalpingpong Extra is structured in the same way as Taalpingpong but this sequel to the first book covers two different profiles: social participation and entrepreneurship. The course presented in this book is suitable for students at language proficiency level A1 to A2. It is compatible with all NT2 and civic integration courses and can be used both at home and in a class setting. 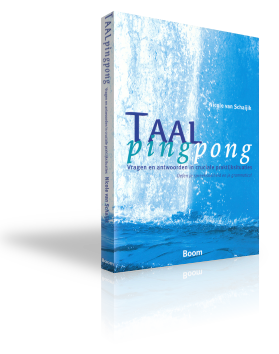 Taalpingpong was launched in the Theater van het Woord in the Public Library of Amsterdam in 2008. In this picture: Nicole van Schaijik assisted by two students who demonstrate how to work with Taalpingpong.